Media 4 Soundbar from Q Acoustics in England is a high value, high fidelity, high performance, high style addition to your media experience. 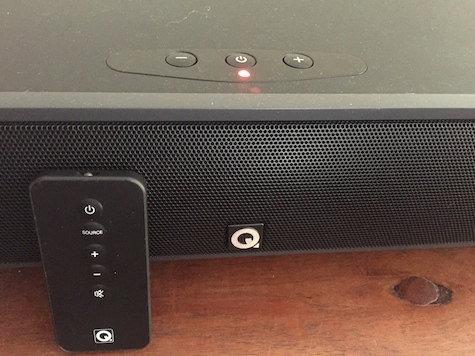 Use this compact and loud 100 watt amplified sound bar to enhance the audio from your television, to play Bluetooth wireless audio from your iPhone or iPad, to boost the sonic presence from your stereo system, to make your Mac rock the rafters, and much more. Media 4 looks and sounds great. Setup is quick using the included cables and printed User Manual. Bluetooth v4.0 wireless audio quality equals wired audio in most listening environments. A small infrared remote control unit is provided with basic power, volume, and mute controls. A wall mounting plate is provided when permanent installation is desired instead of the anti-vibration feet. Optical and analog inputs with appropriate cables are included for wired audio signals when Bluetooth is not possible. A subwoofer port is provided for adding an external subwoofer when bigger bass is needed than comes from the hearty onboard subwoofer. There is no HDMI port. Full instructions for all of the above plus optimum placement are in the detailed manual in several languages. No tools are provided to assist the purchaser with assembly or installation. Up to eight Bluetooth devices can be remembered by Media 4’s pairing list. This unit holds a solid Bluetooth signal for 20 to 30 feet distance between source device and speaker, depending upon walls and doors between the two. The attractive black sound bar is substantial, yet sleek, weighing roughly 11 pounds (4.9 kg) and being just over 3 feet (1m) in length. The front grille is unadorned except for a small Q logo bottom center. There is a rear center area bulge that tapers to a narrow slim side profile. Media 4 has a two year warranty. Media 4 Soundbar has a powerful and pleasant stereo sound stage. I played it very loud in my studio with enormous listener satisfaction and without distortion. After each music demonstration I did for my weekly iOS workshops at least one person each time wanted to buy a Media 4 on the spot. This product is by far the loudest, boldest one-piece speaker I have ever heard. It excels at Bluetooth and wired audio delivery. More important, it passes the Mrs. Nemo What the %^&* is that, John? test. My wife likes Media 4’s looks on top of our living room stereo cabinet. She approves heartily that we use it as our primary listening device when we watch streaming or live television content. I like being able to adjust the volume when necessary from the sofa across the room. 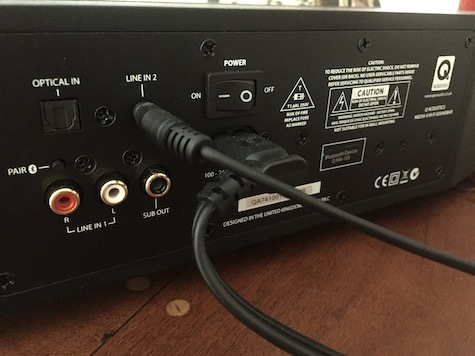 Do not place this sound bar on the floor in front of your television. Elevate it as high up in the room as is realistic for best sound. The unit can be offset several feet to the right or left from the television, because the stereo effect is subtle and within minutes you forget the sound isn’t front and center. Media 4 Soundbar is new to the USA market. With an affordable price and outstanding performance it will become a best seller quickly. There are not yet many detailed technical reviews of this product. Here are two links with raves and photos that will assist you when considering its purchase. Additional video reviews are online also. Two suggestions for Q Acoustics. Include a small screwdriver so the typical consumer can screw the rubber feet into place without having to go to the hardware store first. And either add some LED indicators to the black remote control unit or change its color to white, because it’s difficult in a dark room to know the placement of the volume and mute buttons. Great looking speaker. Call the fashion police about Nemo’s color combination.